The Hawke Frontier® ED 10x43 open hinge binoculars feature phase corrected prisms, offering the user crisp, clear and bright high resolution viewing. In addition the ED glass increases performance further and enhances the light transmission. All this adds up to increased viewing pleasure. Images are bright, and colours are true throughout the field of view. 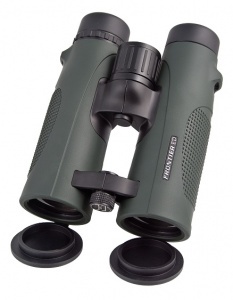 The body made from magnesium alloy is exceptionally strong and offers excellent component stability while the 'open hinge' cut - away design reduces weight making these binoculars less tiring to hold for prolonged periods of time. With a minimal close focus of 2m and an extra wide field of view, the Frontier® ED range will not disappoint whether you are viewing close or searching distant objects. The binoculars feature twist-up eye pieces and an adjustable dioptre. All models are nitrogen purged to avoid fogging and they are sealed to be fully waterproof. Hawke Frontier® ED 10x43 offers a complete package including a hard protective case, stay on lens caps and comfort neck strap. Available in Black or Green.